FYI- Long post but if you have been wondering about which type of colloidal silver to use. There seems to be no end to colloidal silver fads. It’s a crock, of course. Pure and simple. And below, I’ll explain precisely why you might want to avoid this silly little fad altogether, and why pure, unadulterated ionic colloidal silver is the absolute best way to go if you’re going to ingest colloidal silver for any reason. In this silly fad, you use a use a colloidal silver generator to make the ionic form of colloidal silver. But you add the ash of baking soda (i.e., “washing soda”) to the water as an accelerant. After you’re done making your batch of washing soda and ionic silver, you then add Karo syrup (corn syrup) and heat up the mixture in a microwave oven in order to trigger it to turn golden brown in color. Alternatively, you can leave the batch setting out for 24 hours until it turns golden brown on its own. Of course, this is one of the absolute silliest colloidal silver fads I’ve ever seen. First of all, it’s critical to understand that there’s no such thing as “true colloidal silver.” It’s a made-up marketing term. You won’t find it anywhere in the medical, clinical or scientific literature, because it’s a completely fabricated term. The correct term is simply “metallic silver” or “elemental silver,” because that’s all it is, i.e., particles of raw metal silver. In spite of the fact that ionic silver is clearly and unequivocally the active, infection-fighting form of colloidal silver, what these Karo syrup kooks are saying to do is take your perfectly good ionic silver and use chemical means (i.e., washing soda, Karo syrup and heat) in order to convert the ionic silver into metallic silver before ingesting it. The problem with doing this is simple: Even if it worked -- which it probably doesn’t, as I’ll show you shortly -- metallic silver is nevertheless completely inert against pathogens. Indeed, metallic silver has zero infection-fighting qualities. So what happens when you drink this chemically-produced elemental (metallic) form of colloidal silver you’ve supposedly created by adding washing soda (as an accelerant) and Karo syrup (as a supposed “reducing agent”) to your ionic silver? Your body then has to go through a long, slow and haphazard process of converting the metallic silver BACK into the ionic form in order for it to kill pathogens. And this can only happen when some of the metal particles of silver you’ve ingested come into contact with oxygen and acidic fluids inside your body, and begin to shed silver ions. In short, by drinking this homemade “metallic” silver concoction, you’re simply adding an unnecessary burden to the body -- i.e., your body has to gradually convert the metal silver particles you’ve ingested back into biologically-active and biologically-available silver ions. Of course, this long, slow and thoroughly arduous conversion process inside the human body dramatically slows the killing of pathogens, and thereby delays healing. So the whole idea of using a handful of household chemicals and some heat to convert ionic silver into metallic silver, only for the body to have to convert the metallic silver back to ionic silver so it can kill pathogens, is utterly ridiculous. It’s ludicrous. And frankly, it’s just plain nutty. Study Shows Ionic Silver Is Up to 10,000 Times More Effective than “True Colloidal Silver”! 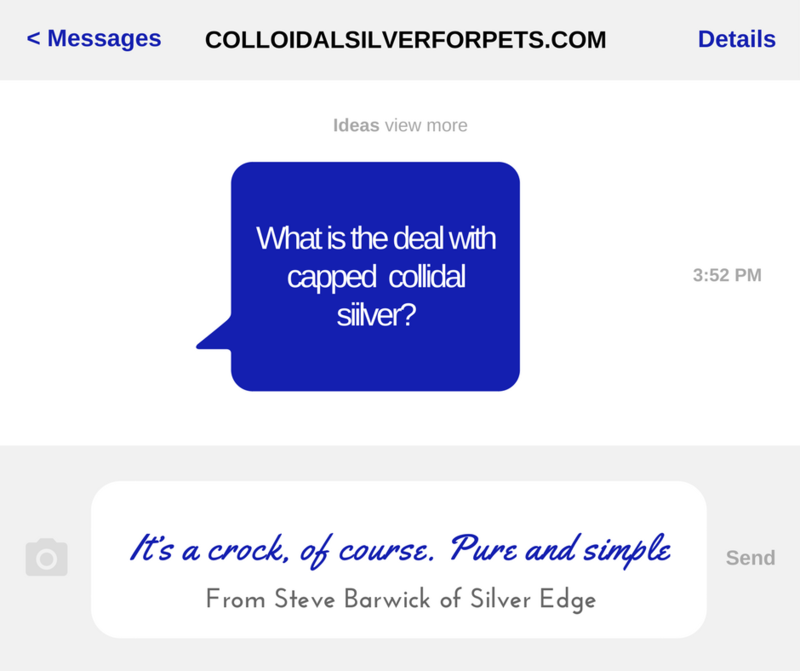 What's the Truth About So-Called "True Colloidal Silver"? Many chemistry experts say that the only thing being produced during the first step of the process (when you add washing soda to your water before making colloidal silver with it) is an ionic silver compound composed of silver ions bonded to soda ash, the result of which is silver carbonate, not "colloidal silver." And this silver carbonate compound, when heated as instructed along with the added corn syrup, is then further converted into a silver carbonate and corn syrup compound. In essence, you’re giving your colloidal silver a candy coating, much like caramelizing an apple. Instead of ending up with metallic silver as the purveyors of this fad claim, you actually end up with nothing more than a silver-carbonate-corn-sugar compound that turns golden brown because the resulting silver particles are so large they act like “mirrors” in the water, reflecting and diffusing light from the visible light spectrum. This discoloration, of course, is a detriment, and not a benefit. That’s because, whenever your silver particles are so large they can actually reflect and diffuse enough light from the visible light spectrum to discolor the water, it’s going to be extremely difficult for your body to absorb, distribute, utilize and afterwards excrete those excessively large silver particle compounds. Finally, it’s important to understand that a good, high-quality ionic colloidal silver suspension will always be crystal clear in color. That’s because silver ions are so small they can’t reflect and diffuse light. It’s their extremely small size that makes them very easy for the body to absorb, distribute, utilize and afterwards excrete. So if you’re getting yellow or golden-colored colloidal silver, you’re producing overly-large silver particle compounds and/or agglomerates that are reflecting light from the visible light spectrum, which in turn discolors your batch of colloidal silver. All you can do sometimes is just shake your head at the utter ridiculousness of some of these fads. The people touting them don’t even seem to think them through. They apparently just want to draw attention to themselves by coming up with something “new” and “different” regardless of how silly it actually is upon closer examination. The bottom line is that high-quality colloidal silver can only be made correctly with pure silver electrodes suspended in distilled water. Running electricity through the silver electrodes while they’re suspended in the distilled water drives billions of sub-microscopic, biologically-active and biologically-available silver ions off the silver electrodes, independently suspending each one in the distilled water with a positive electrical charge. That’s pure unadulterated ionic colloidal silver – the active, infection-fighting form. It’s the most popular form of colloidal silver in the world today – and has been for over 60 years – for the simple reason that it works best. NO additives or other adulterants or accelerants should ever be introduced during or after the colloidal silver-making process. That’s because the electrical current running through the silver electrodes, along with the positive electrical charge on each silver ion, will cause the silver ions to chemically react with the additives and produce overly-large silver compounds and silver particle agglomerates. These extra-large silver particle compounds and silver particle agglomerates are extremely difficult for the body to absorb, distribute, utilize and afterwards excrete. They’re not biologically-active. And they’re not biologically-available. It’s like trying to eat dirt in order to get your daily minerals. It will do you no good whatsoever, because the human body is not equipped to absorb and utilize elemental minerals. It chiefly absorbs and utilizes ionic minerals. That’s why, when plants absorb elemental minerals from the ground as they grow, the plants slowly convert those elemental minerals into ionic minerals. That’s the only way the human body can effectively utilize the minerals. If minerals from the ground remained in the elemental (i.e., metallic) state in food plants, you’d end up with severe mineral deficiencies. That’s because the human body is not equipped to effectively utilize elemental minerals. So nature herself converts the elemental minerals into ionic minerals for you, inside the plant, before you harvest and eat it. That’s why, for the past 60 years, people have used the ionic form of colloidal silver and not the chemically-produced metallic form. Nature’s way is almost always the best way. It’s when man starts hankying around with nature that things go sideways. And this “colloidal silver, washing soda and corn syrup” fad is a great example of that, in my opinion. The late night television comedian Craig Ferguson used to read ridiculous things off the internet, and when his audience would laugh at what he'd just read, he'd look at them incredulously and say, "Well, it must be true...it's on the internet!" Of course, he was making fun of the fact that there’s all kinds of nonsense on the internet, and just because something appears online doesn't make it true. The "colloidal silver, karo syrup and washing soda" combination is one of the cases where I'd have to agree with Mr. Ferguson, i.e., just because somebody took the time to write an article about it or do a video, doesn't necessarily make it true. I've been studying and writing about colloidal silver for well over two decades. Indeed, my 547-page book, The Ultimate Colloidal Silver Manual, has been the world’s #1 best-selling book on colloidal silver for over 10 years. And in that time I've seen many, many colloidal silver fads and strange claims being touted by alleged colloidal silver “experts” who seem to come out of the blue. We’ll cover six or eight more of these silly in a future article. So stay tuned. But just like fad diets which come and go, in like manner colloidal silver fads come into style and go back out of style again, just in time for the next big fad to come along. What these fads all seem to have in common, to me anyway, is that they usually can’t live up to their own hyped-up claims when you examine the details in light of science and common sense. In my opinion, this is certainly one of those cases.